Metta World Peace knows that he's tougher than you, especially if you're an NBA player. And he's not afraid to say it. He hasn’t yet locked in a guarantee that he’ll be on the roster for the 2015-16 season. But for entertainment’s sake, here’s hoping that Metta World Peace is a member of the Los Angeles Lakers on opening night — because a quote from World Peace is something to behold. Yep, World Peace went full "Get off my lawn!" to the NBA’s youngsters. It’s pretty common for players to talk wistfully about how the game was different when they played, but it’s rarer that a current player gets a chance to reminisce about a simpler time in his career. But World Peace is an old man by NBA standards; his rookie season tipped off 16 years ago this month. One of the few current players who could confirm or deny World Peace’s view of the league is Kobe Bryant, who’s definitely not soft. 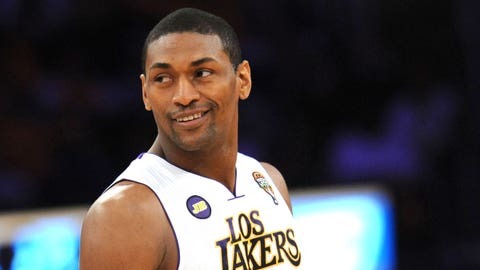 Of course, World Peace didn’t throw his Lakers teammates under the bus. In fact, he called second-year Lakers forward Julius Randle "a man," saying that Randle’s ceiling "is as high as destiny." It’s not entirely clear what that means, exactly, but it’s a very World Peace thing to say.